1. A musician who is a consummate master of technique and artistry. 2. A person who has special knowledge or skill in a field. 3. Someone who has a cultivated appreciation of artistic excellence; such as, a connoisseur or collector of objects of art, antiques, etc. 4. Obsolete: A person who has special interest or knowledge in the arts and sciences; scientist; scholar. 5. Etymology: A "scholar, connoisseur", from Italian virtuoso (pl. 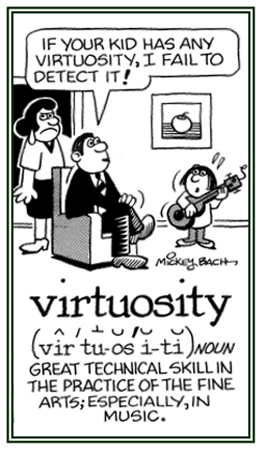 virtuosi), a noun use of the adjective meaning "skilled, learned, of exceptional worth", from Late Latin virtuosus. Meaning "a person with great skill" (as in music) is first attested in 1743. 1. Excellence or merit in objects of art, curios, and the like. 2. A taste for or knowledge of such objects. A reference to or characteristic of a virtuoso: "They loved her virtuosic performance." 1. The character, ability, or skill of a person who is highly skilled in music or another artistic pursuit: After years of practice, Becky’s virtuosity on the flute was brillant and exceedingly dazzling! 2. A great technical skill or captivating personal style; especially, as shown in the arts: Martin loved reading literature and possessed great virtuosity and mastery in writing his own novels. 3. 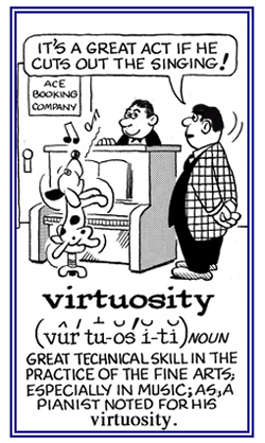 Etymology: from Latin virtuosus, from Latin virtus, "virtue", "excellence", "skill", or "manliness." © ALL rights are reserved.